Discussion in 'Autograph Collecting' started by darthskellington, Jul 6, 2005. Anyone wishing to write to Mr. Jones may temporarily do so at this venue, where he will be performing in a play. The play will run November 21 to April 10. As he will be in London for this time, I don't expect anyone will receive replies from the NY address during these months. Phylicia Rashad of the Cosby Show is performing in this play as well. 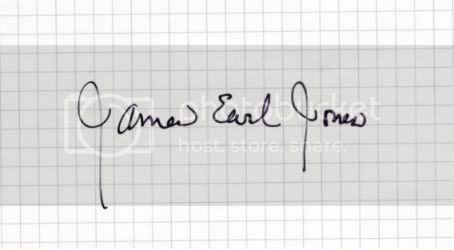 Awesome success from Mr. James Earl Jones today! He signed all my 3 CCGs (Darth Vader, I am Your Father, and Death Star) with silver sharpie + a little extra! I was slightly confused at first though, since the Js in "James" and "Jones" look different from what they normally look like, but all other letters clearly are his trademark style, so I asume he was in a rush or just didn't have a desk to sit at while signing. Thanks for the address @Novello, Chewie! It worked! It was kinda risky, since I saw no successes from that address anywhere, so I jumped up and down when I recieved the letter back today. + It only took 2 weeks. Thanks, Mr. James Earl Jones!!! Very Nice!! JEJ is truly amazing when it comes to fanmail. I've written him 4 times and each time he signed my items and returned them all quickly!! Got a fantastic response from James Earl Jones today. I contacted him whilst he was in a play here in the UK asking if he would be kind enough to sign a figure for me. 4 weeks after the play finished I received a Darth Vader postcard saying how sorry he was for not being able to complete my request and agreeing to sign the figure if I sent it to the US. Today the figure came back! Along with a couple of pics I sent. Superb guy! WOAH! That's nice! Love the signed ROTS figure! Congrats! Where did you get that Vader pic in the middle there? Thanks. The middle pic was downloaded from the internet! If you want the file PM me your email address and I'll send it to you. Congrats again! Btw, which of the US addresses did you use? Those look great! What address should i use now? i want to mail to him tomarrow, please lemme know! I've written to him several times and got a reply back every time! Sending one out tomorrow for my kids to the Pawling address. Got a great success back today, he inscribed our pic "To the Jackson Family, may the Force be with you!" Kiddos were super excited. Thank you!!!!! Sent to the Pawling address as noted above. Nice success. I need to send off a CIII Vader figure sometime. Got my multi signed photo back from Mr. Jones! Got it signed by Jeremy Bulloch at CV and Jason Wingreen TTM. Now just need Dave Prowse and Billy Dee Williams to complete it. I received my autographed package back from Mr. Jones last Friday (March 11). Sent it off during the last week of January. I sent a Dave Prowse autographed glossy (Vader & Boba) as well as a CIII Carded Vader figure. He signed the glossy in silver (as did Mr. Prowse) and signed the front of the bubble pack on my figure in gold. Was VERY excited to get the items back. Now, I have to send the glossy off to Jason Wingreen and Jeremy Bulloch. Any recent successes with JEJ? Has anybody ever sent him a poster TTM with any luck? I've got a multi-signed poster that I'd love to add him to but nervous about sending it. Hope everybody is having a great 2012! Thanks! Great to know I shouldn't send it now. So if I wait until April are you saying that the first thing I do is just mail a plain letter telling him that I have a poster that I'd love for him to sign and ask if it's ok for me to send it to him...then I would get a return letter saying it was ok, etc.? I'm in the same boat as you, the poster I'd REALLY love him to sign I would never risk so was thinking of sending one that had a lot less time/money put into it and starting with his great sig and building from there. Thanks again for the great feedback! Yep, that's what other people have done and usually get a reply with instructions from his assistant for sending it in. Good luck!